The perfume alchemist who adores painting and art. She uses her artistic imagination to create scents that encode the fragments of nature. Her creation of scents will take you to embrace the simple happiness as if you are wandering through nature. Follow her story of inspiring scents on SabaiArom Happy Blog. 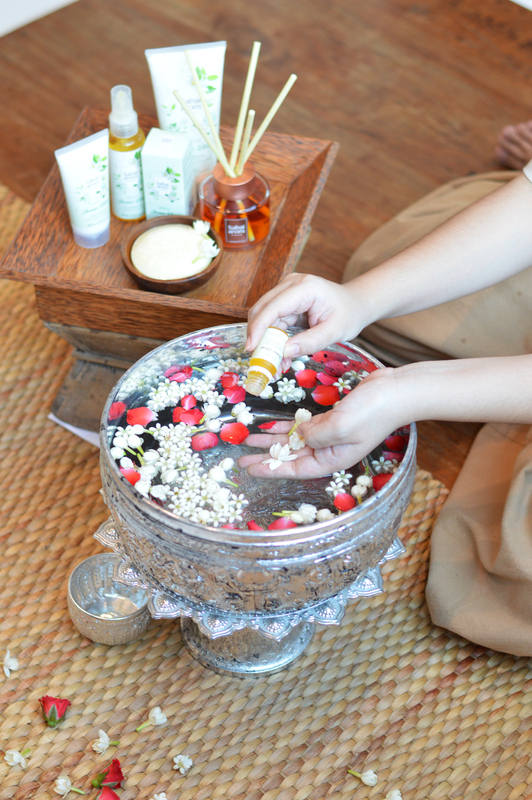 Jasmine flowers are native of India, that came to Thailand at the same time with the propagation of Buddhism. In addition, in the Ancient Indian’s legend of the Great God, the Kamadeva, or the God of love has a deadly weapon that makes human fall in love by shooting arrows though the hearts, and it is incredible that the end of Kamadeva’s arrows are actually not blade but jasmine. For this reason, the ancient Indian beliefs consider jasmine to represent pure love and this is the reason why jasmine flowers are popular for the Thai people to use to pay respect to the Buddha or the elderly. 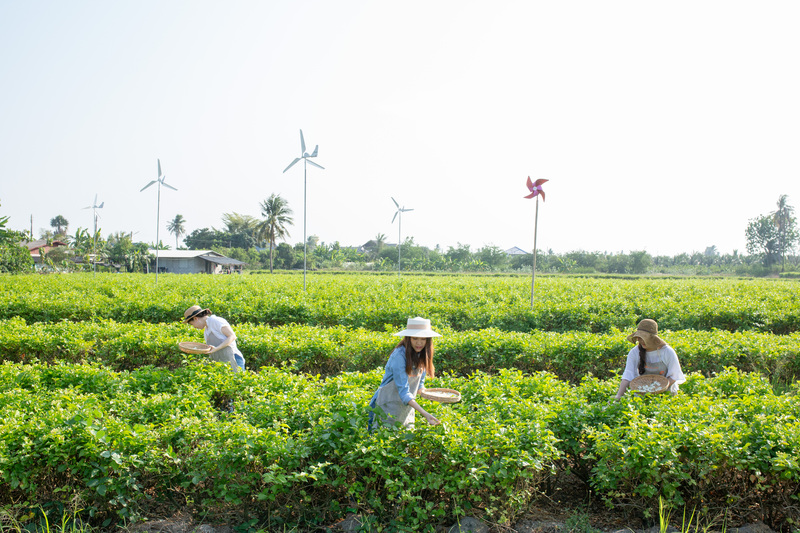 In the Thai medicine formularies it mentioned that Jasmine flowers have medicinal property and is classified as “Cool effect medicine” which helps nourish the heart, helping to reduce fatigue, strengthening the body, relieve the heartburn and thirst. 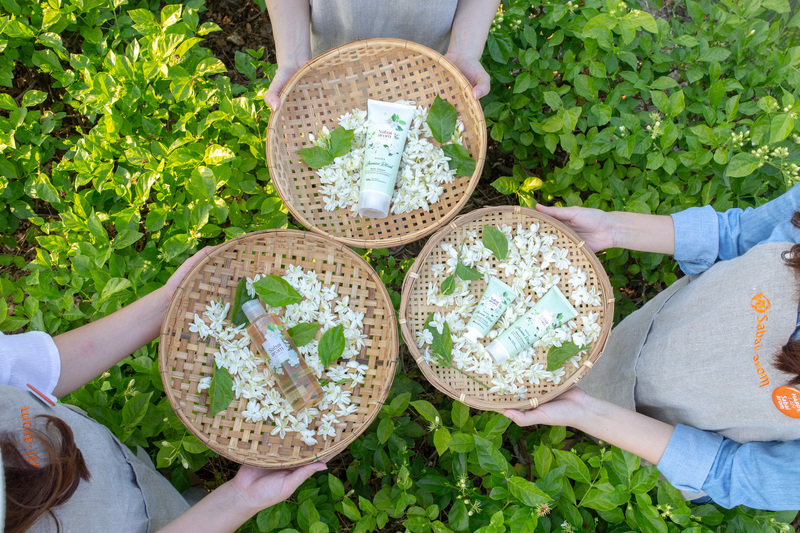 For this reason, jasmine flowers are used as ingredients in the Thai traditional medicine pharmacopoeias with 5, 7 and 9 ingredients. 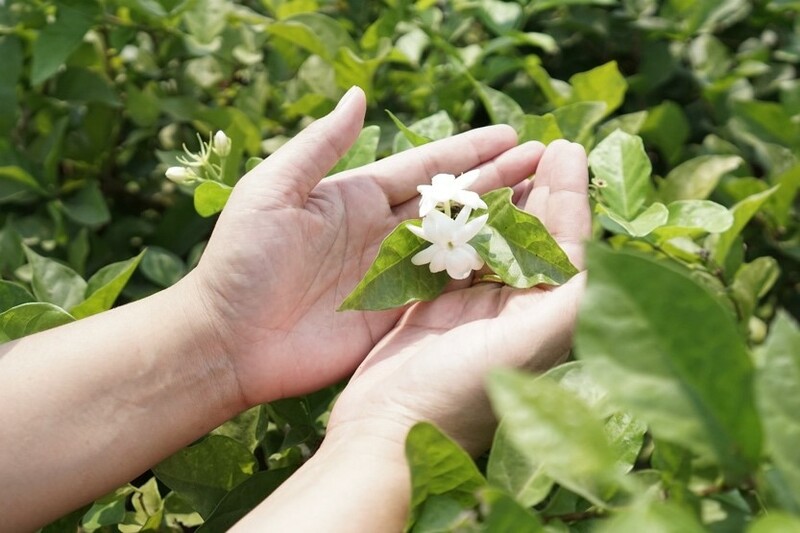 In the pharmacopoeias, usually only the pollens are used, but for jasmine flowers, the whole flowers which have properties that specified in the text book which are, help treat the heart disease, reduce the body heat, and reduce fever, relaxing the mind, treatment during pregnancy, relieve the heart burn and thirst, cue the eye disease. Because Jasmine has a bitter flavor, it also relieve the symptoms such as diarrhea, dysentery, stomachache, chronic wounds, itchy skin. 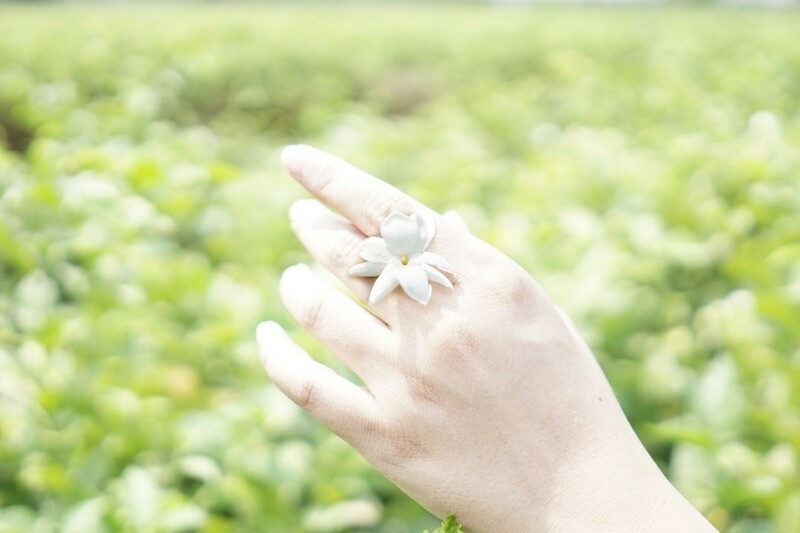 Drinking water floated with the fresh jasmine flower can nourish the heart, and when grinding the fresh flower mixed with Menthol (Pimsen), it help reduce the body heat and help with the cold. In the Thai Medicine formularies, jasmine has been used to mixed with Yahom which has the property of heart nourishment, reduce the dizziness such as, Yahom Thepajit, Yahom Navakot, Yahom Thip O-sot and Yahom Intajak in which jasmine are used as main ingredient due to the effect of Coronary Vasodilating and Cardiotropic Activities from jasmolactone B and D that extracted from jasmine. This supports the usage of jasmine flowers in the Thai’s Yahom formularies which was used to treat dizziness since ancient time. It was found that jasmine essential oil can help stimulate the nervous system for people with mental fatigue, sleepiness, fatigue and help with emotional balance as well as relieve headaches in people with stress or fear, and also relieve muscle pain. The main substance is phytol. Jasmine flower and Thai style heat reduction food. When thinking about the taste of summer, the new generation would think about the dessert such as ice-cream, shaved ice or smoothies, but there’s one dish which is not dessert but the dish derived from the wisdom of the older generations that create the dish which made to consume in hot season to reduce the heat. It is called Khao Chae or rice soaked in cool water. 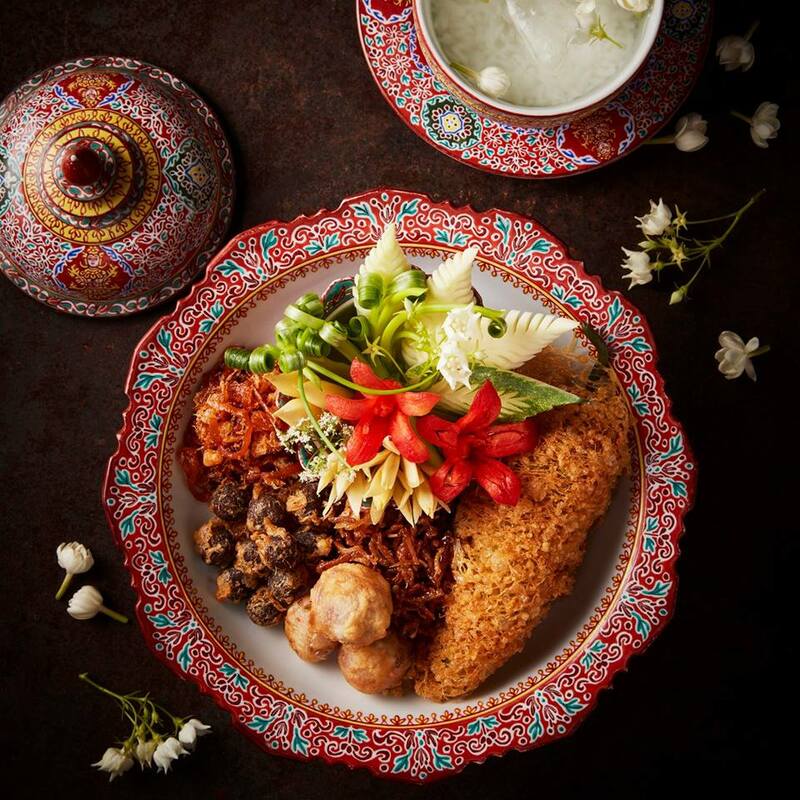 The recipes are varied, as it was considered to be royal cuisine, but there’s also commoners recipes as well, the most famous one being the Petchburi province’s Khao Chae. Water for Khao Chae In the past , jasmine flower in rain water was used. The water was kept cool in the earthen ware pot and when it’s time to eat, camphor or menthol would be sprinkled into the water to cool the dish. Fried Kapi Ball This is considered to be the heart of the dish, to see who is good in making Khao Chae, you must look at the fried Kapi ball. The ingredients are, red shallots, garlic, galangal, kaffir lime zest, grilled fish, toasted coconut, good shrimp paste and wild ginger. These ingredients are mixed together and made into small balls and then dip in raw eggs and fried. Stuff sweet peppers This is adapted from the Hainanese minced pork and salted fish recipe, but only minced pork are used with added fish sauce then wrapped in a lacy egg wrapped. Fried shallot Cut out the shallot in middle and added the shrimp paste mixed with shredded pork and coated in flower and deep fried. Shredded sweeten pork In the past, the beef was used, but some people these days don’t eat beef so the pork is used instead. Stir-fried sweet pickled Chinese turnip : braised the turnip, and stirred fried until dried and seasoned. The side dish that is very important for Khao Chae is finger roots which often carved into Champa flowers, when eaten together with the fried Kapi ball it will create the most delicious flavor that goes well together. Other side dishes are green mangoes, scallion carved in the form of flower and also red cayenne pepper. With Khao Chae, not only you can experience delicious Thai style unique meal but it also has the cool affect on the body as well.